EpaA boatman on Brahmaputra River, 43 miles from Guwahati, Assam, in this June 27, 2008 file photo. The last in a three-part series on peace quietly breaking out in India’s Northeast. 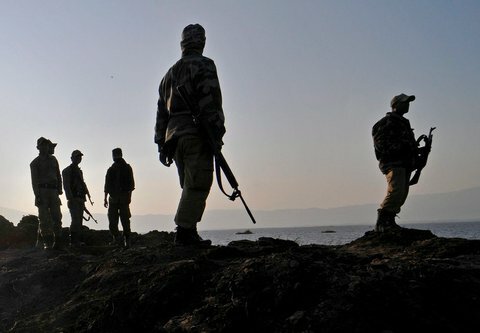 For India’s Northeast to have a bright future, the region will need to avoid a few minefields. Most importantly, “a sustainable peace, including in the Kachin state (in Myanmar), is essential for all this to happen,” wrote Thant Myint-U, the author of “Where India Meets China,” in a message. This peace, and the subsequent the reopening of road links, and the Trans-Asian Railway – which seeks to connect India to Myanmar – could be held up in the Naga inhabited areas because of disputes among the Naga, Kuki and Meitei ethnic groups over control of the hill tracts of Manipur. Forming a crucial link that would connect India to the economies of Southeast Asia and China ultimately depends on the calming of several ethnic battles. Roads through Manipur are frequently blockaded for months over the issue. Elections for the Manipur state assembly provided a break in the usual routine of ethnic animosities, but those could erupt again at any time. In addition, the larger region could find itself in turmoil over environmental issues sparked by an attempt to build 168 big dams here. Popular protest movements have already gathered steam over these dams, which many people fear will lead to loss of their land and livelihoods. There are also fears of earthquakes leading to dam ruptures in this region. European Pressphoto AgencyProtesters participate in a rally against the construction of mega dams in the Assam-Arunachal Pradesh border region, Guwahati, Assam, July 14, 2010. 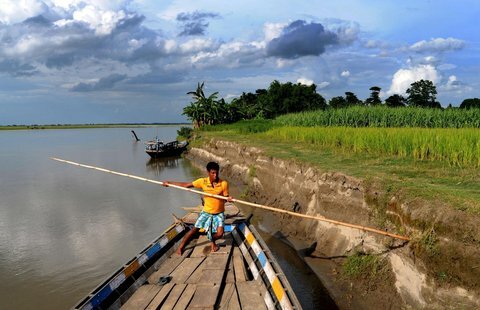 Answering local residents’ concerns about the dams is essential to lasting peace, said Sanjib Baruah, a professor of political studies at Bard College in New York and author of “India Against Itself,’’ a book about conflict in the region. Mr. Baruah recently spent several weeks in Assam, where he traveled with hopes that “we may indeed be able to soon talk about post-conflict/post ULFA Assam,” he said in a recent interview by e-mail. (ULFA, the United Liberation Front of Assam, is the major insurgent group that has been fighting for the state’s independence from India since 1979.) “But after traveling to Lakhimpur-Dhemaji, seeing the anti-dam protests, and reading the Assamese press, I am no longer sure,” he said. “The hydropower dams under construction, or on the drawing board in Arunachal Pradesh, appear to be an enormous source of anxiety in Assam,” he said. Moreover, the hydropower is meant almost entirely for use elsewhere, at least for the moment. “The region is being groomed to play a familiar role: that of a resource frontier – supplier of natural resources to fuel the engines of economic growth elsewhere,” he said. It is a role that breeds insurgency and anti-state protests. “My tentative formulation is that the politics of identity is slowly giving way to a politics of anxiety,” said Mr. Baruah. Political parties and insurgent groups in the region have long championed rights of particular ethnic groups. The protests against the dams, though, have united ethnic and religious groups as they face shared fears. He doesn’t see any easy way of all this sorting out. European Pressphoto AgencySecurity personnel patrol insurgency affected areas of Thanga constituency, Binsupur district on the eve of the Manipur State Assembly elections, Jan. 27, 2012. Almost every one of the seven states in the Northeast has experienced a higher population growth than in India as a whole. Local residents tend to blame migration from Bangladesh and Nepal, though large families are common in the region. Good governance could prevent conflict, said Mr. Sahni, but given the quality of governance the region has experienced, there is reason to worry. Indian officials have also expressed concerns that China may be providing support for insurgent groups in the region. Paresh Barua, the military chief of the ULFA, is said to be under Chinese protection somewhere near Ruili on China’s border with Myanmar. The National Socialist Council of Nagaland’s Isak-Muivah faction, the most powerful insurgent group in Northeast India, has also re-established contact with China, Home Secretary G.K. Pillai said in February. China has denied all this, saying in a statement on Feb. 16 that it follows a policy of not interfering in the affairs of other countries. If the leader of the National Socialist Council of Nagaland (Isak-Muivah), Th. Muivah, 76, dies or retires without a settlement being reached, the group, which has rearmed during the 14 years since the cease-fire, could go back to war under a new leadership, a Naga activist with links to the group, who spoke on condition of anonymity, said in an interview last month. Across the border in Myanmar, cease-fires with the ethnic armies are tenuous where they exist. Any settlement would have to give political autonomy and control over local resources to the ethnic groups. That is, if the Burman majority don’t fall out among themselves. Both India and China stand to gain greatly from peace and progress in these parts. China’s relatively underdeveloped Yunnan province, where about 40 percent of the population belongs to ethnic minorities, borders Myanmar on one side. India’s relatively underdeveloped Northeast, with its mainly tribal states, is on the other. Trade between the two countries has been rising, and hit an all time high of $73.9 billion in 2011. There is, however, a big trade deficit of $27 billion in China’s favor. The two giants of Asia will come closer as flights, roads and rail links connect both to Myanmar. Whatever happens next will determine the destinies of close to half the world’s population. Earlier, the author looked at the Northeast’s expanding foreign ties, and young population’s desire for prosperity and connectedness. The writer is editor of the Mumbai edition of The Asian Age and author of The Urban Jungle (Penguin, 2011). He can be found on Twitter as mrsamratx.